Looking at him from head to toe he has short grey hair save a single patch of fire copper red braid. His eyes are hazel and eyebrows are silver. His beard, mustache, and hair are now grey, with a few holdout red hairs. On his shoulder is a tribal tattoo that wraps around the whole arm covering all of his upper right arm and on his back is a tattoo of his name in runes that goes from shoulder to shoulder. On his right leg is a eye of Thoth (a gift from his new god Thoth). His build is a rough and hairy build that stands 3 foot 5 inches and weighs a light 136 lbs (although there is a possibility of weight change from good cooking). His hands are rough and worn from his life as a sailor. 4 new maps of the western seas one that give a path around W.E. water defense. Because slavery is a common thing (Overkill is indifferent about that), the Red Beard was used to free slaves of the Alg tribes (namely because there were dwarves on board) but there was a combination of usually all the known tribes especially the big three (Alg tribe the Northern Wilderness, Nyurg tribe the Dragon’s Claw, and Skyold tribe the of the Land of the Damned). Some of the chieftains were ok with Captain Overkill and let the Red Beard pass most of Bizantium waters without incident but politics changed constantly so they had to be on their guard all the time. This usually made for good relations between the barbarians and the pirates and because their shipwright skills were equal to his own. A lesser known tribe callled Joruuth became the home of the Red Beard on long stops and Overkill made lots of friends and even got used to their Northern dialect (-10% for those not familiar with the tribe) Because tribes would usually allow the pirates to roost after a raid until the heat went down, allowed Overkill visited distant cousins and freed men that were tribesmen and was honored (but not official; he didnt marry into the tribe) as a member of the Joruuth tribe (even got sweet on some of the ladies). Overkill has a number of tattoos, his name in runes on his back, a tribesman tattoo on his left arm (it takes all of his upper arm making him an unofficial member of the Joruuth tribe). Towards the beginning of his mission, Thoth (the god of knowledge) added his own mark to the dwarf (a treasure to be sure) on the dwarfs right leg. Prior to that, being a member of the Redbeard Crew he had crew tattoo; a tattoo of a symbol of water mixed with the symbol of swords. Each crewmember has a different version of it but its clearly recognizable to each member. Traveled to the Eastern Territories under command of his Lord to gain allies to further their cause of piracy and unrest to Bizantium. It was while he was there that the young dwarf encountered Isis. When he was a child he would pray to Osiris, the law giver, for justice and equality to all men unaware of his clans predicament. He had turned his heart away from Osiris and towards Thoth the god of learning and knowledge. He no longer wanted justice but knowledge for revenge. He had glimpses of insight but nothing solid but then in a vision Osiris appeared and called him to repent and turn to Osiris and that there would be a time when he would call him to do a task. 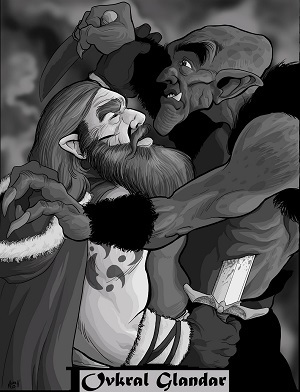 For the next several months the dwarf has fought from being selfish and more compassionate. He still distrusts humans but he would not be where he is unless he learned from them. The goal is to liberate a people that has turned their back to his seafaring ways and bring them back to the mainland. Overkill speaks Northern fluently but prior to joining CrIsis he prefered Dwarven or Eastern though, at the time, didn’t speak it well. Also at the time, he still worked hard to separate himself from his Northern roots. When talking to those that spoke Northern he spoke through a translator because of his angst for those that were from Bizantium. In the past two years he has become more familiar with other languages and has taken time to get back to his roots. When he joined CrIsis he has changed his name, Overkill (a,k.a. Merd Goose) has adjusted his look to be more foreign looking with his hair and clothes taking tips to further his disguise which has changed over and over. He has several swords and has made them treasures. Two of the original were dwarven quality and he has named them Striker (the scimitar) and Hawk Eye (the broad sword). One was given to Minishmee as a gift before he became king. The first weapon was a clan gift upon graduating to manhood. The second weapon was a personal gift from his father. He (his father) hoped that it would protect him in his piracy career. The weapon has protected the family for 263 years making his great grandfather the original owner. He didn’t name Hawk Eye, that’s what its always been known as. Those that knew the dwarves of Bizantium may have heard of the sword. Now he has two clearly different swords, Calandor and Gremenor (details seen above). Several others have come and gone in his possession and if they are not in his possession, they are in a chest on Rogtilda. In recent times he reflects on his younger days as a captain. He writes frequently to his cousin and former first mate, Captain Minishmee former captain of the Red Beard and former king of Bizantium. Traveling around in the water has been simpler. There has been run ins with gods and beasts. He has traveled thousands of miles and seen sights and heard sounds that a lot of men will never experience. This is going to be the greatest adventure ever. Other letters have been to the Master Librarian, a close friend of the Librarian, and to his Wife. Several others have have random letters such as kings and alchemists. In his travels as captain of the Rogtilda, he has seen gods and been commissioned by the gods to gather the sailors of the Redbeard and collect the pieces of Osiris. The family of the Readbeard Clan is simple and complex all in one. The family consists of a combination of three types of dwarves. Those of Redbeard, those of Goldenbeard and those that are considered wild dwarves (the barbarians). Overkill is from the house of Iron Forge, one of the eight houses (Iron Forge, Black Axe, Moon Heart, Red Hammer, Rune Maker, Silver Beard, Onyx Eye and Fire Forge) that hold seat in the counsel of the Clan. Iron Forge has three families with a matriarch at the head (Great Grampa Kug passed three years ago). Overkill has two sisters, Rona and Roti aka. Raven and River (no one goes by their true name but by an acronym that reflects their behavior growing up. While Raven is flighty and bubbly, River is strong willed and will run you over. Raven is married to a wild dwarf (barbarian) named Epee Kak while River stayed single (but is looking to cut a stud from the herd as it were). His parents are Tokata (his mother) and Valden (father a.k.a. Onslaught). They go by Treetop and Valley. Valley (again known also as Onslaught) his father is more of a homebody and his mother Treetop has her head in the clouds with adventure and excitement. She talks fast and is an awesome cook like Mary. All of the Redbeard Clan (not the sailors) has some symbol of red in their hair (either artificial or real) to show their Clanship. And though there is eight families that are loosely related to each other when they greet one another they call them cousin.